Qualification: Three years experience as Head Assistant/ Deputy Superintendent Personal Assistant. Preference WII be given to the retired person having at least three years working experience as Superintendent in fields of Forestry and Wildlife. Qualification: At least 2nd Class degree bachelor or master Natural Sciences, Physics, Chemistry, Geology, Engineering a recognized university. 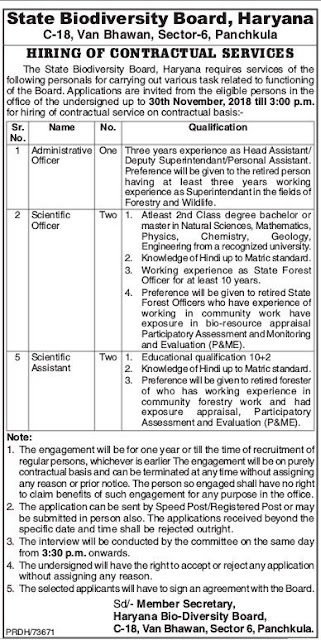 Working experience as State Forest Officer for at least 10 years. 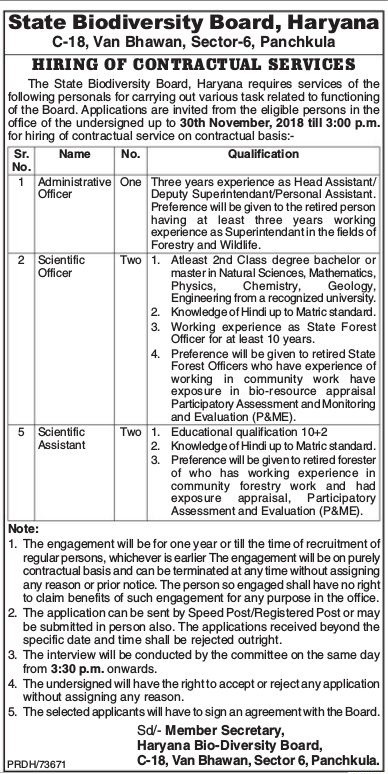 How to Apply: Applicators are invited from eligible persons in the office of the undersigned up to 30th November, 2018 till 3:00 p.m.
0 Response to "State Biodiversity Board Jobs 2018-19 For 05 Administrative Officer, Scientific Officer, Scientific Assistant Posts"